One question has kept many people up at night, and also started many family fights: Am I an alcoholic? While alcohol addiction treatment is not at the point where there is a blood test to determine if someone is an alcoholic, there are symptoms that can be used to diagnose the disease. Let’s look at some signs that you may be struggling with alcohol, and what steps you can take to help yourself. Simply put, addiction means a person keeps doing or using something repeatedly, for the promise of some internal reward, like the high feeling, or emotional numbness for example. Plus, the person keeps using or performing that behaviour, in spite of any adverse consequences, like damaging their physical health and relationships. An addiction can be a behaviour, like gambling, because a person will keep doing that thing, getting an internal reward for performing the actions, and will keep doing it in spite of obvious problems, like a financial ruin. Or more commonly, drug & alcohol addiction is centred around what is called a psychoactive substance, which means a substance that affects the brain and nervous system. Alcohol is a very powerful psychoactive substance, and even though it is legal and promoted by society, it is very highly addictive. Alcoholism, or clinically it is called substance use disorder, is the addiction to alcohol or other drugs. No one wants to look in the mirror and have to admit to being an alcoholic. Unfortunately, that kind of denial and resistance is what keeps many from seeking the help they so desperately need. To be diagnosed with a substance use disorder relating to alcohol, a person must have at least two of these symptoms. The more symptoms a person has, the more severe the addiction, and the more necessary treatment is to their health and well being. Take a moment to look at this list to see if any of them sound like things you or a loved one are struggling with right now. Alcohol is both psychologically and physically addicting, this means that it can be a habit formed in the mind, but also become something the body is so used to, that it needs it to function. 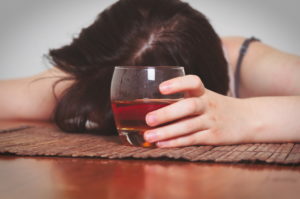 At some point, people with severe alcohol addiction conditions drink just to feel normal. They will not even feel the buzz anymore. 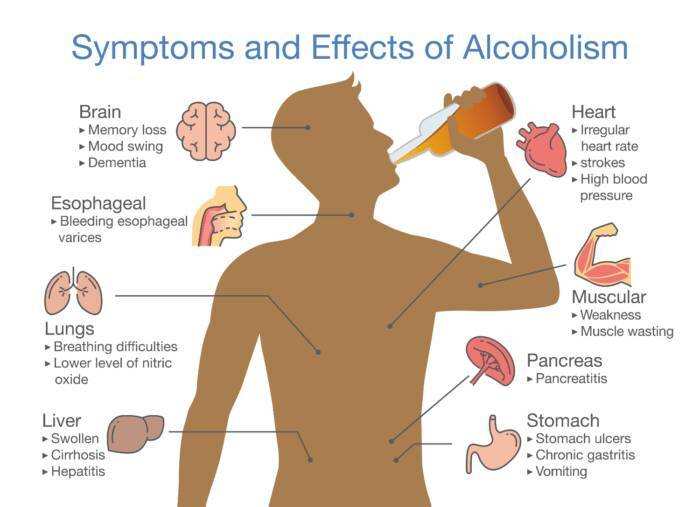 If you are experiencing these symptoms when you stop drinking, that is the body’s warning sign that you are addicted and need help. When you have these symptoms, you need help, and an addiction detox centre will be one of the safest places for you to go. While cutting down or quitting drinking is a good first step, you should always consult with a physician or detox personnel before making that decision. Alcoholics who have been drinking long enough can be so addicted to the drug that they cannot quit “cold turkey” they need to drink a little less each day until they are down to nothing. If an individual requires around the clock medical supervision to help them through their detox treatment, it’s recommended they opt for inpatient alcohol detox. Inpatient alcohol addiction detox is highly recommended because patients will always have medical assistance on standby in the case of an emergency. The vast majority of alcohol detox programs are inpatient. Alcohol detox units exist to help a person through the withdrawal period. They will provide emotional support and encouragement during this process, which usually lasts about a week. Medical staff are on hand often to help someone struggling with addiction withdrawal symptoms with medication to treat those symptoms, like antidepressants or anti-nausea medication. At a rehab detox unit, their job is to help a person get through withdrawal, so they can be stable and head into rehab treatment programmes. Detox does not treat the alcohol addiction, just the withdrawals. And report that their relationships have got better with less fighting and better interactions with loved ones. This list alone should give many right now enough room to think that maybe giving up drinking is worth it. While the alcohol addiction and the withdrawal may be uncomfortable and wear you down, know from this that there is a much better life waiting for you. If you or someone you love are struggling with an addiction to alcohol or other drugs, do not wait to reach out for help. Contact us right now for detox or rehab treatment help. Detox and inpatient treatment staff are ready to help you. They will work to get you through the worst of it so that you can live the happy and healthy, clean and sober life you deserve.